It is getting close to the Time for my 'Five Golden Coins' App submission. I will be submitting the Game/App/Book to 3 places. Each one of these has slightly varying requirements, and I have submitted before to all three. Now what I did not do was make a nice succinct list of these requirements. So I am going to do that later today. I will do a follow up post, as none of my Twitter buddies appear to have this list either. Now of course having a list does not mean that the requirements will always stay the same. In fact they may change monthly for I know (though I suspect not). Still having a nice list with what Icon Image sizes I need for each submission can only make the process go that much smoother. Last time I did this I created the correct sizing on the fly and worked my way through all the submission requirments a sI went. A bit cumbersome and slow. Also I am sure I did not make the best of the submission process becasue of that (it felt stressful). So this Time i am going in prepared, or as Much as I can be expected to at this time. Tonight I start taking screen shots and makign Icons etc (yeah, i am no good at it really, so it will take me some time). As well as the Icons and screenshots there is also the marketing blurb to create, though in this case In have enough of that (more than usual). I learnt something this weekend. Something about recording voice over for a game, though my latest creation does not have voice over in the regular game term, it is in fact me Reading the pages in the book turned app. Well to be precise it is Me areading all the pages, and also my daughter Leilani reading all the pages. I already blogged about having better equipment and the differecne it made to the quality of the spoken audio, so i won't go back into that. However after I recordeed the better audio i managed to use an audio tool that my friend from work had recommended (Dan). He told me about an app that would allow me to refactor all my audio to approximately the same level. He even went so far as to try this out on some of my audio and tol me how good it was. Then he supplied a copy of the app from somewhere on the web. The program/app that he used is called the Levelator. When I tried this Levelator out on some of my Old crappy audio I have tos ay that I was not so implressed, in fact I could not understand why my friedn Dan had been so excited about it. However Once I had better Audio I figured I should o due diligence and check the Levelator out again. And... OMGoodness... It was amazing. One of my longer pages that I read had my volume go up and down slightly during the page being read. I wasn't to bothered as I figured I could always adjust the volue (amplify) just the low sections etc. This program did it all for me. It also brought up all the audio to be at a normalized level across the whole piece. I was not only surprised, but very excited. This cut down my re-amplification work to Zero. In the end I used this Levelator on all the audio I had re-recorded for me reading the book. Then I tried it on my Daughters readings, adn whammo, once again it did an excellent job. And on her audio recordings it had to work a bit harder as her volume was a bit more variable than my own. I learn't that all recordings like this NEED a Director. When my daughter was left to record her own audio I found I would have problems with it. All direction related. Not happy enough here, not astounded enough there etc. Now what I have recorded from her isn't perfect, but when I directed she was AWEOMSE, when I did not, the results were average.Quite a surprise, and the way she adjusted to my suggestions was amazing. So I learn't that recording voice over NEEDS a Director. So now I hacve all the recorded Audio for the female and male readings done. It is a very exciting thing to hear all that disonnected audio playing out in order properly. Very exciting indeed. I now have 2 bugs to fix and test the application on an iPad, and then I can send it off to the artist for final approval before launching it onto the iDevices and Android devices. As I cannot get on the Sony Forums today (something wrong with me signing in). I figured I would post something here. Firstly lest talk about this special difficult prize the golden Penny. This should be won by completing Penny Pincher with 5 perfect throws of 250 (that means hitting the red hexagon). at present the prize cannot be won as we made level 10 only require 1000 points to win level 10. which means if you are throwing perfectly then you will WIN the game before you get to throw your last penny. We appologize for that error. We had tested the winning of the Golden Penny when the top level was harder to achieve. Then we made the scores per level lower (easier) and Whammo we cannot win the Golden Penny. We have put in a fix for this and that fix is simply to make level 10 require 1025 points, which we feel should not really make it any harder for the most part for people to win level 10. This fix will not of course effect anyone who already has completed this game, but it will allow those people to go for the godlen Penny prize. I am not certain of it's release date on Home at the moment, but once I do I shall post it, though It may only be a couple of days before release. At least you will all know it is time to go for the prize once again. Thanks for all the information that everyone tweeted and Pm'd me about this. I am very glad we got the information to allow us a quick fix. And those of you that are US residents, Don't forget to make sure you sign up for that Amazing contest before you go play the games. And don't forget to check out this weeks prize in the Hot Zone as well. 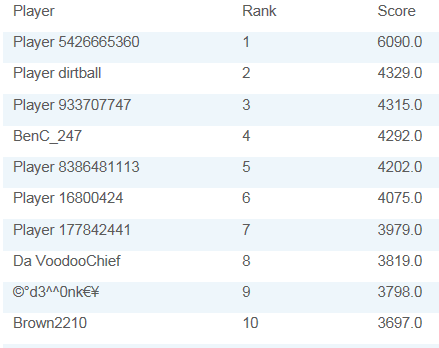 I just checked a few days ago and was very excited to see somone new at the top of the Hot Chicks Card Game leaderboard. They had barely beaten the previous top scorerer and I was still excited to see someone play so well to get that score. Then over the next several days that same player jumped up several hundred points. I was even more surprised to see that new score, as I figured that would be real tough to acheive. Though I personally figured that obtaining a 5K score would be possible. Then I see that the person on top improved their personal best again. Now they are in fact head and shoulders above the rest of the players. Check out the top 10 below. 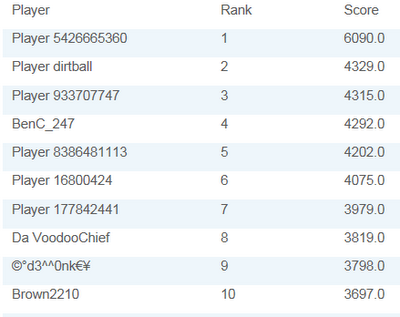 As you can see that is a very large margin of score from player 1 to 2, compared with the Rest of the top 10. Now if there was away to find this player I might like a chat. Though with that default name given by the Scoreloop API, I think the person is untraceable. Well I have known this for years, but better tools just allows even amateurs such as myself to create better data. Improving my production quality no end and for a small price when in fact I have borrowed the equipment I am using. One of the Nice things about working for a Games company is all the hardware they have to carry to make good products. Some of these pieces of kit can be rather expensive. Such as a Microphone and Audio mixer for example. This is what I have borrowed form work as My own recordings sounded a bit muffled on my personal microphone I spent a buncha money on years back. Well the borrowed system not only makes a huge difference in basic quality (like 5-1 i reckon). It gets rid of the muffled sound completely and also allows me to record the audio at a better starting volume. Another good thing is the reaction of the microphone to being blown on when pronouncingf my P's etc. I am not quite sure how to link in the audio for comparison at the moment. I will ask and hopefully get an answer at some point. I would love you all to hear the difference using a professional grade microphone has on the reading audio for Five Golden Coins. After my very successful return on audio loading time reduction. It was time to attack the Image load time. I am using Marmalades Cross platform development system and this means there are a few things that are going to happen when loading files etc. Though there are several ways to achieve loading data within Marmalade I chose to use their resource manager. This is a useful and efficient tool. It did however complicate my new image loading spread technique slightly. I did a LoadGroup on my data block using the ResManager and this happens to load and uncompress to memory ALL the data in that group. My initial group was called AllData, as it used to contain ALL the data I was eveer gonna load (except audio). So changing this full loading behaviour mean't I was required to make another Resource file, or I could of course just make another Group. So I split off the Main Page artwork and the 5 golden coins I have into another Resource file called 'pages.group', and of course removed this artwork from my alldata (which is now misnamed, gah!). Then I load in the first group when booting into the game.. the dreaded initial load. Once it is all in the Title page comes up and the Whole of the title sequence and menu works fine. Only when the title page fades out to go to the actal pages/game itself do I do an on demand load while the screen is fully faded out. There is no noticable hiccups or anything and yet seamlessly the new page comes up and works just fine. I am very happy with this change and have now reduced initial load time to 10 seconds on the iPod3 (my worst performing load times by far). Next up is to do the final recordings of the pages being read by my Daughter, who is supplying the female reading. She has been very busy lately playing as Falkor in a stage production of Never Ending Story in a nearby town. So funny that I have sorted out the load time for the Audio used in Five Golden Coins before sorting out the image loading time. If ya remember I posted a week or two about the issue i was facing... Depressing initial load times. I discovered the iPod3 had the worst loading time of all the devices I have at my disposal and so have targeted that as my main focus. So the load time for just the initial Audio load was tremendous, being at approximately 18 seconds and more Audio to add. I wanted to try and get this down to 3 or so seconds. And that I have done, in Fact it is much quicker than that. I have a multi-stage plan now in place. 1. Initially load only the Audio that can be heard at the start of the game. This is just a button click and the first pages audio. Takes approximatley 0.25 seconds to load. 2. Once the game is running just keep preloading any audio I might encounter before I get there. This makes it seem like the audio is always there, as it is loaded slighty before demand. 3. Once a SFX is loaded, mark a flag so I know it is now resident and don't bother loading again. This is working so well that I am now done with Audio load times. Now All i have to do is something similar to the artwork. The release of Midway3 went world wide today and in some ways it looks good and some not so much. I am Aggravated and Annoyed! Well finally the cat is out of the bag. There is a contest associated with the Release of Midway3 and it has a whole bunch of REAL WORLD prizes and money (though only open to US residents). Check out these two pages for more information. The first one has an interview with our designer Paul Mithra as well. Yes, It is REAL, and people will win weekly Sony prizes and later in the Contest they could win 1000 dollars as well as part of the prize. I am personally hopig this kind of promotion will bring lots of new interest into Playstation Home and along with that interest lots of Playstation 3 owners will come check the place out. Good luck in the Contest you US residents. As for the rest of the world. I sincerely hope you enjoy the Midway games and the prizes you earn along the way. I posted last week about testing my 5GC app/game/book on several devices at once. What I did not really mention or talk about was their respective load times. Load times are something that I feel is very important, and how you deal with slow load times as even more important. As games get bigger their memory footprint just gets bigger as we add more and more content. It is in theory a great thing for players to have more content of a game to enjoy, however if the load times are truly bad, then this will put the player off before they get to see your starting content. There are TWO main things we can do to improve the situation. 1. Compress data to make it load faster, uncompressing data is usually much faster than loading it. 2. Hide the data loading behind splash screens or other intermediate pages etc. I like both of these options, and yet they are both trouble and work. Let me show you the numbers I am working with currently. I have two main times that i recorded, the time it takes to load the images into memory, and the Time it takes to load the Audio into memory. This audio will also be exactly twice as large later this week. As you can tell. My target will be the ipod3. To start with I am going to try to improve the images loading. I have no more artwork to put into the game. So once I have the best load time i can for this area. Then it is done. I am going to start by combining half of my large images and see what difference this makes. Then I will cut my load into two sections. One smaller group of images required for the title page to work. The rest will load once the first set has. This should all happen in a separate thread. Though I will not allow them to go past the first 2 game screens if the load of images has not finished. I am not sure what to do next. Maybe I should try and see what their App Review Board could do for me.It might be interesting to Blog what happens if I do follow that route. After all I cannot do much more for my game, and this is what they replied with for my latest fail. "Apps that present excessively objectionable or crude content will be rejected "
"Specifically, we noticed your app contains sexual content.."
Well erm.. So i have women that are wearing bikinis etc. I am not sure why this would be so objectional to 17 year olds and up. As the game IS rated 17+. "We found that your app contains content that many audiences would find objectionable,"
Which audiences is my question, as i mentioned above it is only available to 17 and up. Maybe it is ladies who are the audience that would find it objectional. Hmm, maybe it Is too raw. Still, this blog post is about frustration with the system more than me going on about what I think of My content in this game. It would have been real nice to see how this game performed versus the Android version. As it is, I am not sure I can be bothered to Bother with iOS for this game at this point. And i AM positive Apple do not give a flying fig about me and my games. Here's hoping you all do better than me if your game is a bit riske. Ever heard of the Hot Zone ? Well now you have. It is a nice location that sits perfectly between all 3 of the Midways. As you can see from this next picture. And finally here is a picture of the main Hot Zone area. As you can see it has access to all three Midways and also a nice teleport A potty to Darla's Den. This Area will be released with Midway3. Thanks for checking out these pictures, and see ya in Home. I have my Five Golden Coins app going realy well. In fact it is very close to being finished and ready for submission, only the audio is left to do.. And you may realise that in fact that is a big job, as the audio in question is the reading of the book. So not a short job, but a straight forward one, or I hope it to be. So far I spent about 30 minutes recording and re-recording me reading only the first 10 pages of the book. To say that is about a minutes worth of audio would be correct. So at this rate I will be done some time next week, haha! Well of course I hope to improve and get faster at this task. Though reading in the middle of the night while everyone is trying to sleep feels a bit odd, foolish maybe, certainly weird. Maybe next time I'll get the family to leave the house and record what I need while they are out and about. Then I can be as loud as i want, which will help the micophone no end. Hmm, yes.. onto my post about the title of this post (confused yet?). The kindle fire has a little side bar on screen while you play a game on it.It usually resides on the bottom of the screen, and switches depending on the orientation of the tablet. Well my game is a portrait mode game and so I would like this bar to be along the bottom of the screen, where it will not interfere with my gameplay. Only... It isn't. It is in fact still on the long side, so when playing my game, the bar sits along the left side of the screen, annoying me! Ispent more than a few hours last night trying to figure out how to move this bar, to no avail. I read about Android Themes and all sorts of forum posts about any sort of bar, be it Action bar, Quit bar, Title bar, Status bar, all without a resolution to my problem. In the end I have started a forum topic with Marmamalade Forums and hope someone knows the answer to this issue. I am hopefull it is a really easy dumb problem to fix. Today Hot Chicks tcg will pass 1000 users in it's high score table (leaderboard). I am very excited by this and wanted to do a post specifically to comemorate this mielstone. Currently it sits at 997 entries, so in an hour or so it will pass this number. YAY! This I am hoping will be a small milestone that will get dwarfed once the iOS version eventually comes out. Yes, I am still working on it. After their last complaints and rejection I have removed all the awesome suggestive sounds, and in place there are more.. comical sounding ones. To lighten the sexual tension etc. I am sure everyone wants a release date. However I cannot do that as we are still in the process of bug and feature fixing. As you can probably tell this has been a fairly substantial job recently and has taken many man hours to get done. Though I can confirm we are getting closer, our bugs from Sony have dwindled now to only a few so far this week, and that is an exciting development. The main reason for the testing and bug fixing to take so long is simply that Midway3 is Huge! Not only is IT huge, but also we needed to modify all the games from Midway 1 and Midway 2, as there was a lot of deprecated functionality in the new SDKs from Sony. The other Midway fixes were required as we found some disturbing information that several aspects of those scenes were broken, some in certain regions, some just plain not working correctly. For example we have fixed the 'Meet Darla' photo opportunity minigame in Midway 1 (yes that is already live now). A problem we here at Mass Media Games were not familiar with. We have also fixed so many other smaller aspects, like the lighting in Trigger happy, again in Midway 1. That was due to a basic Home lighting default change, which was easy for us to fix and now looks much better. Many many more fixes have gone in as well and I will reveal more as soon as I am able to confirm them. I am getting more excited now about the release of Midway 3 and I think you Playstation Home users will find this to be possibly the most exciting release in Years. Have a good time, and cya in Home. So many times this kind of thing catches me out. I am so annoyed some times when I realise I have not really read the documentation properly. This is one of those cases. It seems as if the older I get the worse I am getting at this type of thing, so making more work for myself for what I feel is no good reason. Gah! So my Sound Effectsm in my game were clicking, at the beginning of the sound and also on some of them at the end. Two clicks per sound. Now I realised really fast this must be an encoding error... Only I am using a nice sound editor and one that produces good sound on when played on the PC. I am using NCH softs Wavepad, check it out here. This problem had me baffled as I already have a bunch of Sounds in my game that do not appear to click. Now I know I was just plain lucky before haha. What was the problem ? Well it was in fact that the Marmalade SDK simple sound api takes RAW sample data. And I had saved out the sounds as .Wav files, which contain a 40 byte header... Gah, what a pain. Save each sound effect out as a Raw 16bit 11K Mono sound. Simple and easy in this package. In fact it will also batch this for you if you have a bunch to change. Now my sounds are great.. only they do not yet work on my iPod. Though that I believe is something to do with packaging and directory structure issues I have inside my Marmalade app.